Whether you’re a ladypreneur, girl boss, boss babe, female artist or craftynista, today is the day to recognize businesses owned and operated by women! You can also quickly share any text that you highlight on this page through Facebook or Twitter. Try it out! After the success of the first Woman-Owned Business Day on May 1, 2014, UrbanGirl will continue to support and collaborate with other woman-owned businesses. We are still taking submissions for our directory, which we plan to update again mid-June. Businesses interested in getting involved can fill out and submit this form, and find more information about upcoming events on the Facebook page. 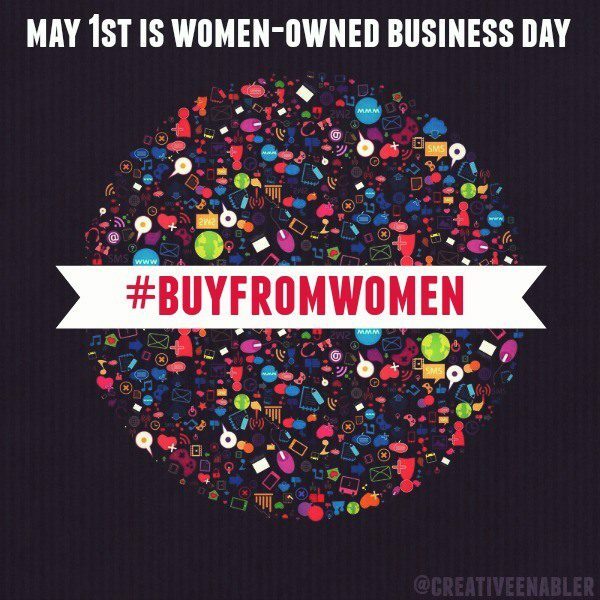 We hope consumers will continue to buy from women and use our directory to find woman-owned businesses every day, not just May 1. What is Woman-Owned Business Day? Woman-Owned Business Day falls on May 1, which is a prime shopping day for Mother’s Day gifts. The day exists to encourage consumers to shop from woman-owned businesses. Inspired by the investment gap between woman-owned and male-owned businesses, the founders hope to create awareness that woman-owned and woman-oriented businesses can succeed and are good investments. Help support this cause by purchasing from woman-owned businesses and promoting the day on social media using the hashtag #buyfromwomen. Why do we need a Woman-Owned Business Day? It is more difficult for women to get loans and investments in their businesses. This is not because women are incompetent. It has been shown that successful startups have more women in top positions than unsuccessful ones. Although nearly 50% of startups are led by women, only 7% of companies backed by venture capital are led by women. This means that women are capable of success, but have a harder time getting investments to start a business. Anecdotally, we have found many businesses owned by and marketed to women not taken seriously by investors because they did not understand the female consumer. The Woman-Owned Business Day is a way to bring attention to the many innovative businesses started by women who have the talent and drive to succeed, but maybe not the money to advertise and promote. Why does it matter who owns a business? Consumers have an overwhelming amount of choice when it comes to purchasing goods and services. The consumer instantly has access to hundreds of stores online selling the same product, as well as local stores. While many consumers will choose simply based on the lowest price, some realize that where they spend money matters. If you have a choice to support a large corporation or a small local business, for example, that choice makes a difference to your community. Woman-Owned Business Day does NOT advocate buying only from women or discriminating against male-owned businesses. It is simply about raising awareness to help consumers make informed choices when making a purchase. Mother’s Day is the second Sunday in May. May 1 is a great day to shop for Mother’s Day gifts while also helping out woman-owned businesses. Why is UrbanGirl coordinating these events? UrbanGirl is a woman-owned business. We seek to celebrate and promote other woman-owned businesses. We have interviewed several female entrepreneurs and discovered that women face unique challenges when starting businesses, so we wanted to provide a free way for female business owners to get publicity, to network, and to learn from other business owners. Follow us on Twitter for daily updates.